Feel Bach! flower remedies blog: Stuck in the 50's? Do you know someone who seems "stuck" in the 50's - or the 60's, 70's, or 80's? Maybe it's you - unable or unwilling to fully accept the present, and longing to go back to the past. It may be a sign of a Honeysuckle personality - and living in its negative state. It may be regret over growing older, unable to accept the loss of youth. I think of a woman I know who persists in going out for the evening in her young daughter's clothing - which looks fine on a teen, but not so fine on a woman in her 40's. It may be regret over actions taken - or not taken - and a yearning to go back and do it over. Or it may simply be a strong aversion to change of any kind. Whatever the reason, the negative Honeysuckle state prevents the sufferer from experiencing the joys and opportunities of his or her present life. After treatment, the Honeysuckle personality will remember and learn from the past, and may even honor it. But he or she will no longer be tied to it, unable to enjoy the present. 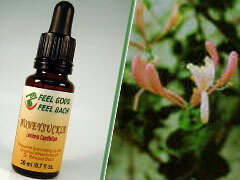 As with all the Bach Flower Remedies, Honeysuckle aids in re-balancing energies and helping the person connect and by guided by his or her higher self. To learn more about the Honeysuckle personality, visit www.bachflower.org. And if you're not sure that this is the remedy for you, come to Feel Bach! and do the questionnaire.